Alexander Woollcott painting in Vermont. Now that my book is out, I am looking at what went right and what went wrong with The Algonquin Round Table New York: A Historical Guide. Today I was in a file of letters, and I came across one that I never got a response to. In 2010, I wrote to the director of the Castleton Free Library, in Castleton, Vermont. This is not far from where Alexander Woollcott and his friends had a vacation house on an island in nearby Lake Bomoseen. 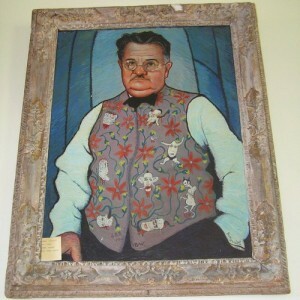 From what I learned, Woollcott, the egomaniac that he was, gifted to the little library a large oil painting of himself. It is the work of John Decker, a close Hollywood friend of John Barrymore and W. C. Fields. It’s based on a photo of Woollcott wearing his favorite vest, embroidered by Mrs. Theodore Roosevelt II. At the time of the letter I was working like crazy to collect as many photos, rare and unseen, as possible. I loved this lost little piece of art, and wanted a photo of it for the book. At the most, someone just needed to get on a ladder and snap a photo for me. (The one in this blog post is from this site). I’m an author currently completing a book about New York City authors in the 1920s and one of my subjects is Alexander Woollcott. I was delighted to learn that there is a fantastic painting of Mr. Woollcott hanging in the Castleton Free Library. I’m writing to humbly request if you could ask someone to send me a photo of the painting as it hangs in the library. Because of Mr. Woollcott’s lifelong association with literature, I’d like to include a photo of your library and the painting in my book. If you would be so kind as to let me know if you can assist me, I’d appreciate it very much. I have until the end of the year to track down photographs, and having this addition would be a real asset to the book. And… I never got a reply. One day I hope to go to Vermont and visit the lake house and I’m going to the library to see the painting. This entry was posted in Research and tagged Alexander Woollcott, Algonquin Round Table, Books, Research, The Algonquin Round Table New York: A Historical Guide by Kevin Fitzpatrick. Bookmark the permalink.